I meet women who make a difference. Women’s rights activists, journalists, workers, scientists, artists, feminists. I meet women, who take a stance. For others. For themselves. I meet them in Algiers and Kyoto, in Chennai, Berlin, in Santiago de Chile, Seoul, Athens, Tehran or Minsk (…). I bring my camera, a tripod, an automatic release and a mirror. I ask them to take photographs of themselves and leave the room. 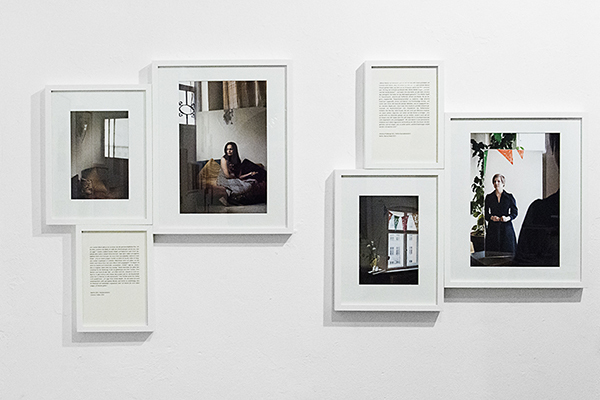 EIGENSINN | OBSTINACY* is a photographic project that gives pride of place to women from different countries and socio-political systems who have one thing in common: they all take a stand on something. Women like the political activist Claudia Dides, who is fighting for the liberalisation of one of the most restrictive abortion policies in the world. As part of the project, I meet women who stand up for their convictions, their way of life, their work – often in opposition to prevailing norms, traditions or the social attitudes of the majority. Women who as campaigners for women’s rights, political activists, academics, feminists, artists and workers make a difference – in big ways and small – that often goes unnoticed in the public sphere. For a few, for many, sometimes just for themselves. For EIGENSINN these women don’t just conform to an image, they insert themselves in that image. The women thus become dramaturges of their own staging. They determine the image revealed by the mirror by making choices about the location, their appearance, their posture, their distance from the mirror, and the moment the shutter is released. Once I have composed the space around the as yet empty mirror by positioning the mirror and adjusting the angle of the camera on a tripod, I myself leave the place where the photograph is to be taken. I cede the control that I, as a photographer, usually have over the image being created to the women. In this set-up, the possibility of controlling one’s own image is offered in equal measure by the mirror and the self-timer. Here the mirror symbolises the everyday alignment of an imagined self-image with one’s own mirror image and anticipated public image; it is a metaphor for the construction of identity and reality. Yet the release of the shutter marks the moment when a decision is made for a certain form of self-representation, which can be an assertion and a question at one and the same time. In a collage technique, I combine each of these self-portraits with one of my own photos and a text based on the interviews I conduct with each woman. The second shot shows a view from the rooms in which the portraits were made. In the context of the work, it functions as a kind of extension of the self-portrait. For this shot, I direct the camera away from the mirror and towards the window and the view outside. The text adds a further dimension, which the images alone cannot make visible. Hence a subjective imagined space arises when portrait, view and text are viewed together in the final presentation of the work. The visual and textual fragments combine to form an imagined image, which, rather than promising objectivity, allows for a multifaceted perception of each woman. These are subjective, fragmentary positions that stand for themselves and testify to the fact that women around the world are asserting themselves in all kinds of ways and in so doing, they are changing their own reality and the reality of others. Thus the works do not represent; as an ensemble, they convey to the viewer an idea of something for which there is no one single image. *My project’s German title, ‘Eigensinn’, has more nuances than the closest English translations – obstinacy, strong-mindedness or self-will – (eigen = one's own or innate; Sinn = mind, sense and meaning). It expresses a desire to create and express your own mind, to impart your individual meaning to whatever your field is, even if it does not conform to ruling conceptions, traditions or conventions.